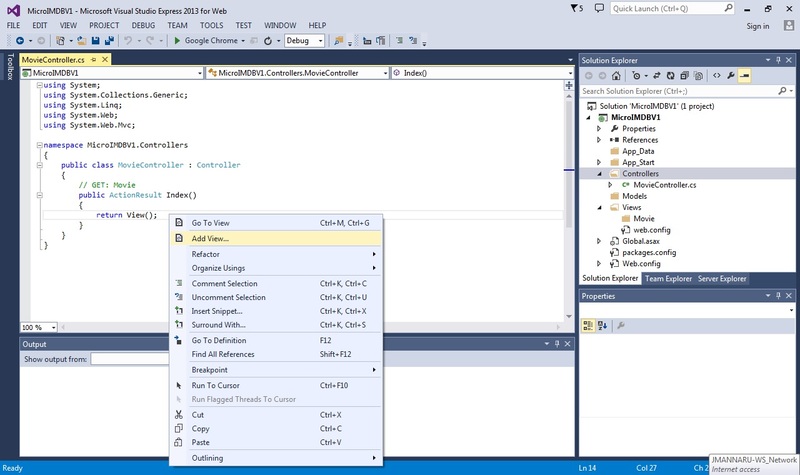 Sidenote : This is the part 3 of the ASP.Net MVC course series. You can get all the parts of this tutorial here. Till last chapter, we saw the fundamentals of ASP.Net MVC application and even we have built Hello World Application in ASP.Net MVC. It’s time to get started with our application – Micro IMDB – in which we try to replicate the popular movie website IMDB. Without further ado, let’s get into action. Fire up Visual Studio. Select empty ASP.Net MVC template and create the project (as explained in last chapter). Our first task is to show the list of movies to the users. 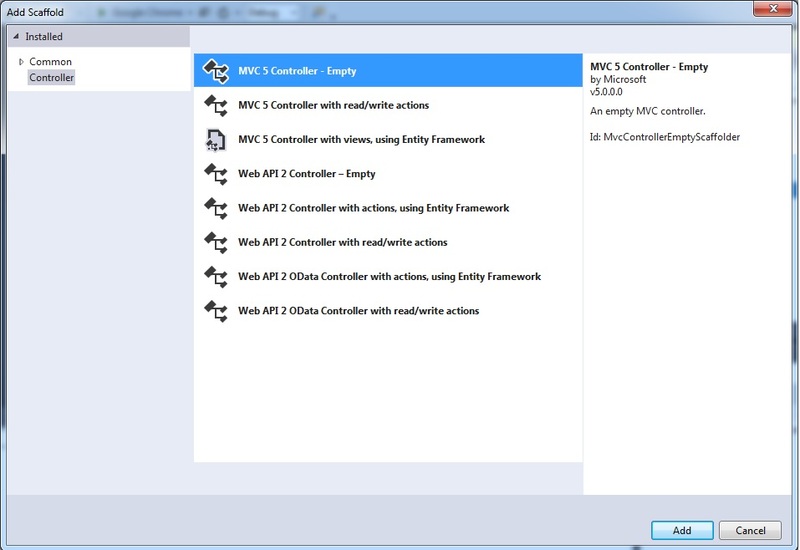 Select MVC 5 Controller – Empty and Click Add. 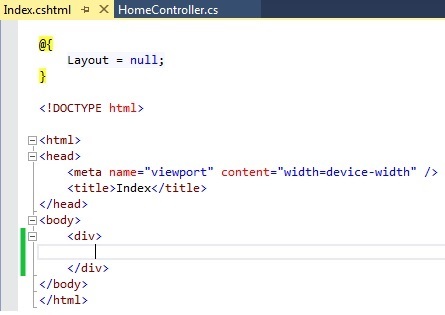 You should not remove the ‘Controller’ in the name as ASP.Net MVC look for classes whose name ends with Controller. All Controllers should derive from Controller base class. Our MovieController also derived from System.Web.MVC.Controller class. Index action method is generated for us which returns ActionResult (which is the default return type for controller action method). It can be used to returning HTML. As discussed earlier, action method could return anything from HTML file to JSON.Here we are returning View (HTML) to the user. In Hello world application of last chapter, we were just returning the string. Now, we are going to return the View(HTML content). First, we create that View. Name: The name of view is given as ‘Index’. I am not going to change it as we are going to show the list of movies in this view and name ‘Index’ suits better. Template: We have not yet discussed on Model layer of ASP.Net MVC. So, we’ll leave the default option ‘Empty(without Model)’ and move on. Later, we can change it, if needed. Uncheck the ‘Use a layout page’ option and click Add. Now, if you run the application(or try to access the URL http://localhost/) it will look for MovieController by default. We have just showed the list of movie title along with year and rank here. What if we have this information in list object(or from database) and if we want to loop through that list? In most of the web applications, we fetch the data from the database and show it to the users. Even in our MicroIMDB application, we have to get the movie list from database and show it some table form to the users. To do so, we need to loop through the movie list and form a table (or any form that you want) to show it to the users. You can use Razor to write this looping logic in your view. 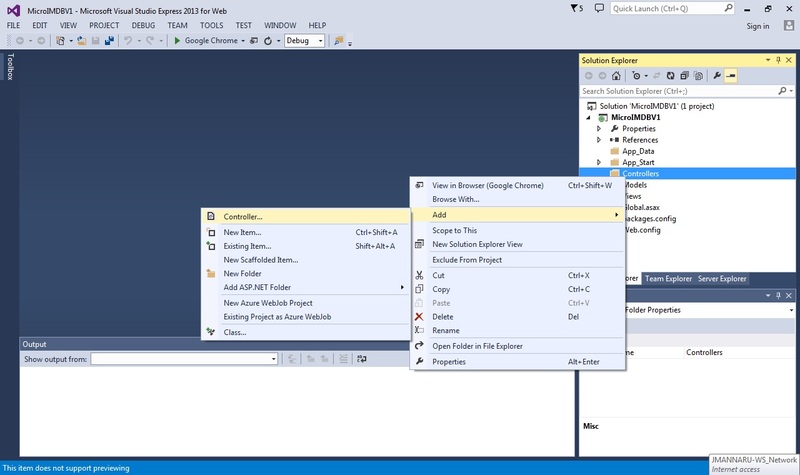 Razor is the view engine which lets you to program (in C# or VB.Net) in the views. Razor syntax is so intuitive that you can mix HTML markup with Razor code and it can easily differentiate between them and display correct information based on the context. Please note that you can use Razor for writing only the display logic. Any business logic should be in Model layer and the data would be passed to the view through the controller. Let us see some examples to understand it better. Our main objective of this section is to learn razor and do come coding. So, I suggest you to create separate solution for trying these razor snippets as you don’t want to litter our MicroIMDB application. 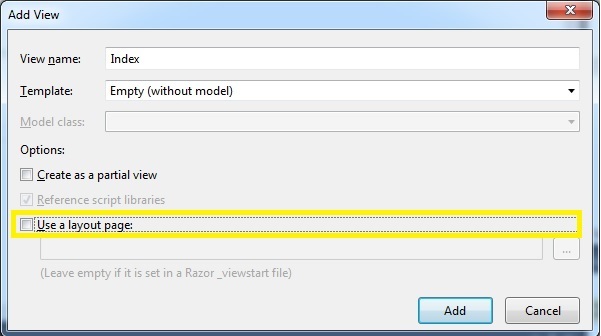 You can follow the below steps to create project to try your razor snippets. Above is the index view generated for us. We are going to write razor snippets within div element. @ is the magical character of Razor – which tells the view that the text following @ is to be considered as razor code. Consider the following code block where we have declared double variable with value 3.14. Razor knows that this is a variable declaration and should not be displayed. Now, razor knows the following text has to be displayed to user with the evaluated value of pi. When you run the application, you may see the following output. Consider the following code where we are generating random number between 1 and 100. You can use any class in Razor code just like we have used Random class to generate the random number. We are checking whether the generated number is odd or even and display the information to the user. If else statement is just like C# , we just have to prepend @ so that view knows the following statement is razor code. Razor is so intuitive – when razor sees ‘<b>’ tag (we don’t have to tell it), it knows its HTML tag and it displays the text in bold with value displayed. When I ran the application, the random number generated was 76 and the following text was displayed. In the above razor code snippet, we have used <b> tag which tells the razor view engine to fallback to HTML mode rather than code mode. What if we want to display it as plain text without making bold? If you do like that, it will throw error. You might wonder why it’s throwing error when everything seems to be correct. The answer is we didn’t tell necessary information to Razor so that it can interpret it correctly. When Razor comes inside if code block, it expects razor code(C# like code) and it infers “The generated…” as razor code but it’s not. So when it tries, error is being thrown. We have to tell the razor that its simple text and it has to be displayed as simple text. We can use <text> tag to tell Razor that it’s simple text. In the following razor code block, we have declared integer array and initialized with prime numbers. We can use foreach statement just like in C#. Just prepend with @ to make it as Razor. The other HTML tags are to make unordered list. Below is the view generated for the above razor code snippet. What if we want to display @ character, say to display twitter handle like @dotnetodyssey? @ character would tell view engine the following text is to be interpreted as razor code. And @ symbol also acts razor escape character. So, to display @ symbol, you need to use @@. You don’t need to remember anything to write razor code. If you want to write razor code, just use @ and start writing razor code. Equipped with razor knowledge, let us rewrite the code using razor. Previously, we have hardcoded all the movie names with rank and year of release. Now, we are going to fetch that information from list and display it using razor. //Create a list out of those 5 movies. See our code has become dynamic now. 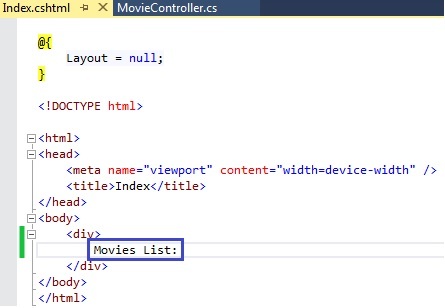 If we want to add movie, we don’t have to create HTML tags – we just have to add that movie object to the list. Rest will be taken care by razor –as it loops through the movie list. Important note: Just to demonstrate the razor foreach loop, we have added the movies list in View itself. You should not do like this in your application. Each layer has its own responsibility and it should do just that. View layer is meant to display information and should not contain any data on its own. All the data/business logic should reside at Model layer.